HJ: Happiness and success leave clues, as they say. By observing and integrating the habits and beliefs of the world’s most effective, happy and successful people you too can begin to experience the same levels of daily awesomeness they have learned to cultivate. And the best thing about this list is that it’s solidly grounded in many spiritual principles and truths. So learning and integrating these qualities is truly an evolution of the self in many ways, not just a strategic move to get certain results. Authenticity is always supreme to strategy. Highly effective and happy people share many of the same perspectives, habits and beliefs that separate them from the rest. They have acquired the behaviors that lead them to more fulfilling lives and a sense of abundance. All you have to do is bring some of these changes in your attitude towards life and you’ll see how simple it is to change your outlook on everything you do. The average person who is given two weeks to complete a task will instinctively adjust his or her effort so it actually takes two weeks. Average people allow time to impose its will on them; remarkable people impose their will on their time and allow fluidity. They don’t stress about time and because their perception is more fluid, time does not become their focus and tasks become more manageable. 2. I live in Gratitude. They appreciate what they have and value it. They count their positives and are grateful for all the good things and people in their lives. They have stopped complaining and are thankful for what they already have. They know that the terms money and success are not interchangeable. They understand that people who are successful on a financial level only, are not successful at all. They have an off switch. They know how to relax, enjoy what they have in their life and to have fun. Their career is not their identity, it’s their job. It’s not who they are, it’s what they do. Unfortunately we live in a society which teaches that money equals success. Like many other things, money is a tool. It’s certainly not a bad thing but ultimately, it’s just another resource. Unfortunately, too many people worship it. They treat failure as an opportunity to learn a new and better lesson from life, and that’s the trick to manufacture optimism in life. They never give up trying because that’s an indication that something better is in store. When they start harbouring an optimistic attitude, success automatically follows. 5. The People Around Me Are The People I Chose. Choose the people you want around you and don’t let people you don’t want around you choose you. If the people around you make you unhappy it’s not their fault. It’s your fault. They’re in your professional or personal life because you drew them to you–and you let them remain. Kind people like to associate with kind people. It’s about aligning yourself with like-minded people. They understand the importance of being part of a team. They create win-win relationships. A mean boss will only attract people he or she can control where a boss that empowers will attract people that love to be empowered. The former is a disempowering relationship while the latter is an empowering relationship. Know the difference. 6. I Release The Past. The past you are now longing for — the past that you are now dreaming about — was ignored by you when it was present. They have stopped deluding themselves. They have a clear vision for the future, prepare themselves, but always be present in the now. They work on this by practicing with simple tasks every day. They have taught themselves that their lives revolve around their day today, not yesterday. 7. I’m Never Bored and I Never Complain. Complainers, whiners and those who refuse to take complete responsibility for their actions and outcomes (or lack thereof) often meet their demise in this respect. They bore easily because they are too busy pretending life has to meet their expectations instead of them reaching out and being passionate about every experience. It’s about being busy, productive and proactive. While most are laying on the couch, planning, over-thinking, sitting on their hands and generally going around in circles, effective people are out there getting the job done. When you are living the life you choose, complaining, whining and boredom don’t exist. Nothing is as awful as comparing yourself to someone else. If you think you’re better that the other person, you’re letting yourself regale in an unhealthy sense of superiority. If you demean yourself in front of others, it means all your hard work and progress has been in vain. While social comparisons are unhealthy, self-improvement is effective. They don’t compare, they consider themselves unique in every way and creator of that uniqueness. 9. I Have Never Paid My Dues. Dues aren’t paid, past tense. Dues get paid, each and every day. The only real measure of your value is the tangible contribution you make on a daily basis. No job is ever too menial, no task ever too unskilled or boring. Remarkably effective people never feel entitled–except to the fruits of their labor. 10. I Ask The Right Questions. They consciously and methodically create their own success by asking the questions that will make them more productive, creative, with a more positive mindset and empowering emotional state. There’s a scientific reason behind every act of kindness that they do. Helping someone selflessly releases serotonin in their brain (Serotonin is the hormone that controls mood) and hence it makes them feel good about themselves almost instantly. They get it. They try to commit to doing one act of kindness everyday to flush out the toxins of depression from their system. 12. I’ve Stopped Using Excuses. They’ve sent them packing and told them they’re fired. They no longer need them. A lot of times we limit ourselves because of the many excuses we use. Instead of growing and working on improving ourselves and our lives, we get stuck, lying to ourselves, using all kind of excuses — excuses that most of the time are not even real. We sabotage ourselves beyond belief. When they find themselves making excuses, the first thing they ask is why they are creating the excuse in the first place? 13. Failure is Something I Accomplish; It Doesn’t Just Happen To Me. Occasionally something completely outside your control will cause you to fail. Most of the time though, it’s you. And that’s okay. Every successful person has failed. Numerous times. Most of them have failed a lot more often than you. But they found lessons in failures, not problems or misery. That’s why they learned how to be effective. Embrace every failure: Own it, learn from it, and take full responsibility for making sure that next time, things will turn out differently. Relationships keep us alive and kicking. In fact, according to research studies loneliness doubles people’s mortality rates. They have a circle of good friends, loving family members and cheerful colleagues that are a reminder that people care and support them. There’s nothing like having someone who you can share your experiences with. So they strive to nurture these relationships and say goodbye to a lonesome existence. Hatred is a negative feeling and harbouring it will have nothing but negative effects on your well-being. They have stopped thinking about the hateful emotion/person and have let it go. They forgive when needed and take things lightly without it affecting them. 16. I Avoid Impressing Others. Success may have nothing to do with how much money you have or how many cars you have, but how you choose to live a life of abundance which comes in many forms, many of which have nothing to do with material things. The moment they stopped trying so hard to be something they weren’t…the moment they took off all their masks…the moment they accepted and embraced who they really were, they found people instantly drawn to them, effortlessly. 17. Clarity, Innovation and Focus. They have clarity and certainty about what they want (and don’t want) for their life. They actually visualize and plan their best reality while others are merely spectators of life. They innovate rather than imitate. They don’t procrastinate and they don’t spend their life waiting for the ‘right time’. The focus and apply themselves. Whenever you raise your hand you wind up being asked to do more. That’s great. Doing more is an opportunity: to learn, to impress, to gain skills, to build new relationships–to do something more than you would otherwise been able to do. Success is based on action. The more you volunteer, the more you get to act. Effective people step forward to create opportunities. Remarkably effective people sprint forward. They look for and find opportunities where others see nothing. 19. I Commit To Goals. If you have a goal, work towards it. Anything is achievable if you put your heart into it. They have learned to adopt wholehearted dedication and diligence to bring extraordinary results and consequentially add to their own happiness. It is very easy to lose vision for what we truly want in life, but it is always our dedication toward our goals above and beyond all obstacles that will make the difference. 20. I ask the right questions. 21. I Care For My Body. They love themselves and their body! They acknowledge that their physical condition has a direct connection with their well-being. A fit body and healthy mind is reflective of happiness. They work daily toward the health of their physical, mental and emotional energy by caring for their body. They connect to a higher power. You’re probably already doing this with or without knowing. Just a quick meditation or prayer is easy. If you have the time, join a local prayer group, visit a meditation center, or simply spend some time alone in nature. People who believe in a deity are generally happier than those who don’t. Sometimes all you need to be happier is a little faith! 23. Not Only Good Communicators, But The Best Communicators. They are good communicators and they consciously work at it. They are more effective than most at managing their emotions when communicating with others and they are not slaves to these emotions. Ego does not rule their lives. They have identified their core values (what is important to them) and they do their best to live a life which is reflective of those values when speaking with others. Their ethical behavior is sound. 24. I Address The Solutions, Not The Problems. People have a tendency of creating more problems than solutions which hinders their effectiveness. They can only see obstacles where as others just have a way of seeing past them and getting right to the solutions that no longer make a problem….well, a problem anymore. They are solutions seekers, not problem enablers. 25. I Am a Dreamer. Imagination fires motivation. They create dream boards and dream up something new to experience. It could be finding a new lover, climbing a mountain, learning calligraphy, or going back to college. Dreams motivate, inspire and expand our sense of self. They also make us happy because they give our lives a sense of purpose. 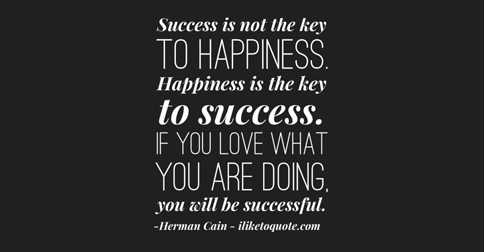 Happy people usually love what what they do, and if they don’t, they love who they are. Dreams remind us who we are. They cultivate a habit of sharing with others — money, knowledge, service, wisdom, care, love. They have found people to share with. In giving, you always receive more. Not only do you get pleasure from giving, you give someone else pleasure. Giving has many unexpected benefits from attracting more happiness into your life, to inspiring others, and changing the lives of those you touch. In the end the whole world is made into a better place. Ask, “how can I serve?” Pay it forward. Give freely. 27. I am Humble and Happy to Admit My Own Mistakes. They apologize when they must. They forgive and they are confident in their ability, but not arrogant. They are happy to learn from others and see other perspectives than their own. They are happy to make others look good rather than seek their own personal glory. 28. I Set Higher Standards For Myself. This in turn produces greater commitment, more momentum, a better work ethic and of course, better results. They don’t rationalize failure. While many are talking about their age, their sore back, their lack of time, their poor genetics, their ‘bad luck’, their nasty boss and their lack of opportunities (all good reasons to fail), they are finding a way to succeed despite all their challenges. 29. I Finish What I Start. While so many spend their life starting things that they never finish, effective people get the job done — even when the excitement and the novelty have worn off. Even when it’s not fun. 30. Being Multi-Dimensional, Amazing, and Wonderfully Complex. They realize that not only are they physical and psychological beings, but emotional and spiritual creatures as well. They consciously work at being healthy and productive on all levels inside and out. They don’t hang out with toxic people and they don’t invest time or emotional energy into things which they have no control of. They do what they can do advance themselves to the best of their ability and never look back, even for a second, because the past is no longer within their control. They plan for the future in harmony with their present state of mind and don’t overplan or overanalyze because they understand that thought processes are constantly evolving and forever growing.